The club was formed in Farnham in 1990 but moved to take advantage of the facilities offered by the Guildford Spectrum Centre when it opened in 1993. We are a friendly club and one of the few that includes an 'open' adult section, a Ladies team (the Spectrum Angels), and a strong Junior Section. We take in part in local, national and international competitions, and regularly organise our own tournaments. The photos show the Spectrum Angels and the 2002 team at the Nautilus Competition at Crystal Palace. 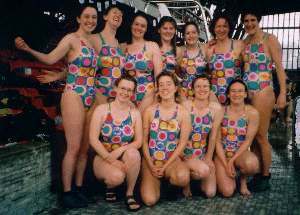 In 2012 the club voted to change the club's name from 'Farnham and Guildford Octopush Club' to 'Guildford Underwater Hockey Club'. The club enters Junior teams into the BOA National U-13 and U-16 Championships - we are the 1998, '99, 2000, 2001 and 2003 U-16 Champions! There are also coaching courses, other Junior Tournaments and friendly matches against other local clubs. We have appeared on ITV's “Energise”, Blue Peter and "Pump It Up". Over the years several of our Junior players (both boys and girls) have gone on to represent Great Britain at the European and World Championships, some even returning with the Gold medal!